Book News: Anonymous Tip Led To Outing Of J.K. Rowling's Alter Ego : The Two-Way Also, Lionsgate on Orson Scott Card; the best books coming out this week. Author J.K. Rowling last year in London. The debut detective novel The Cuckoo's Calling, seemingly written by a former Royal Military Police member named Robert Galbraith, was actually written by Harry Potter author J.K. Rowling, The Sunday Times revealed this weekend. Rowling's publisher confirmed the news. Richard Brooks, the Sunday Times' arts editor, told NPR in a phone interview that "it was frankly too good for a book by an unknown first-time author." The novel, supposedly based on Galbraith's "own experiences and those of his military friends," follows the private investigator and military veteran Cormoran Strike as he delves into the suspicious death of a supermodel. 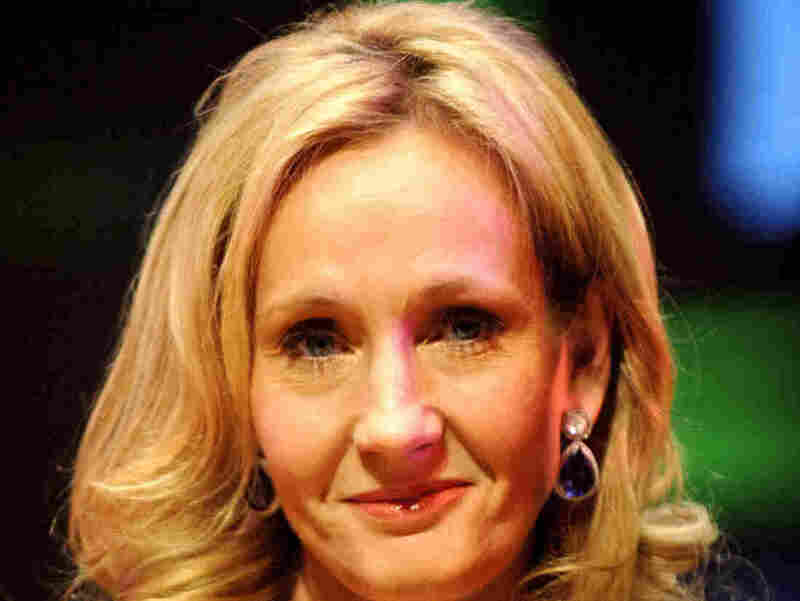 Brooks said one of the paper's columnists, India Knight, received an anonymous tip on Twitter saying the novel was by Rowling. The source's account was immediately deleted. Knight brought the tip to Brooks, who was initially skeptical. But after uncovering telling similarities between the detective novel and Rowling's other work — including heavy use of Latin and themes such as drug use and, as Brooks put it, "disdain for the privileged middle classes," he brought the novel to two linguistic analysts who, though they couldn't say definitely, identified strong similarities between The Cuckoo's Calling and Rowling's other work. Brooks also noted that Rowling and Galbraith shared an agent, a publisher and an editor. To his surprise, when he confronted Rowling's representatives, they confirmed the story. Rowling told the Times, "I hoped to keep this secret a little longer because being Robert Galbraith has been such a liberating experience. It has been wonderful to publish without hype or expectation, and pure pleasure to get feedback from publishers and readers under a different name." Update at 12:45 p.m.: Asked about rumors that Rowling's publisher might have pulled a stunt and strategically leaked the story, Brooks replied, "Absolutely not." He continued: "They would not talk to me despite various requests. I had to do all the detective work." And Tamsin Kitson, publicity director for Little, Brown UK, declared in an email to NPR, "Any info The Sunday Times received was not leaked by us or planned in any way." Rowling publicist Nicky Stonehill likewise denied leaking the author's real name. After threats of a boycott against the upcoming film version of Ender's Game because of author Orson Scott Card's anti-gay marriage views, the movie studio Lionsgate has released a statement clarifying its position on the controversy. In a statement quoted in The New York Times, Lionsgate said, "[W]e obviously do not agree with the personal views of Orson Scott Card and those of the National Organization for Marriage. However, they are completely irrelevant to a discussion of 'Ender's Game.' The simple fact is that neither the underlying book nor the film itself reflect these views in any way, shape or form." Charles Simic writes an ode to summertime in The New York Review of Books: "There's something familial, deeply comforting in the sound of a pig oinking in the peace and slumber of a summer afternoon." Love, Dishonor, Marry, Die, Cherish, Perish is the final book by David Rakoff, the author and "This American Life" contributor who died of cancer last year. The book is an inventive rhyming prose poem, with lines such as, "Susan had never donned quite so bourgeois/ A garment as Thursday night's Christian Lacroix. / In college — just five years gone — she'd have abhorred it / But now, being honest, she [expletive] adored it." NPR's Alan Cheuse called it "cleverly rendered and entertaining." Mark Leibovich's This Town: Two Parties and a Funeral — plus plenty of valet parking! — in America's Gilded Capital is an account of the inner workings of Washington's political and media machines. He spoke to NPR's Rachel Martin this weekend: "It is a profile of a city that I think is widely misunderstood. ... I think what people don't have a full appreciation of is just the full carnival that Washington has become. The way in which the city has been completely revolutionized by money, by new media, by the celebrity madness that's sort of engulfed the rest of the culture."